Yesterday I had a gripping trad experience which had me thinking a lot about the WCS14 ‘be bold be brave’ hashtag. I can be bold sometimes. For years my hardest onsight lead (E3) was also my hardest onsight solo. I love the feeling of being on a smeary grit solo, finding the climbing committing yet ultimately doable. Although I definitely find the harder ones scary, they are never too bad as I climb them knowing that I can’t, won’t, fall off. Falling off is not an option. Archangel – my first E3. Bold but the grade is compensated by easy climbing. Worth the risk. Bravery though is a weird one I think. I don’t know if it’s brave of me to solo bold routes on the grit if I never considered falling an option. If I’m honest, all the routes I’ve been most scared on have been well protected but HARD! These are the ones you’re expected to fall off. Perhaps it is bravery, committing to do a route that you think will be hard enough that you might fall. I think I’ve been ok at that this summer. I’ve fallen off a few hard routes and have been proud of myself to committing – I never used to commit to moves I might fall off, ever! 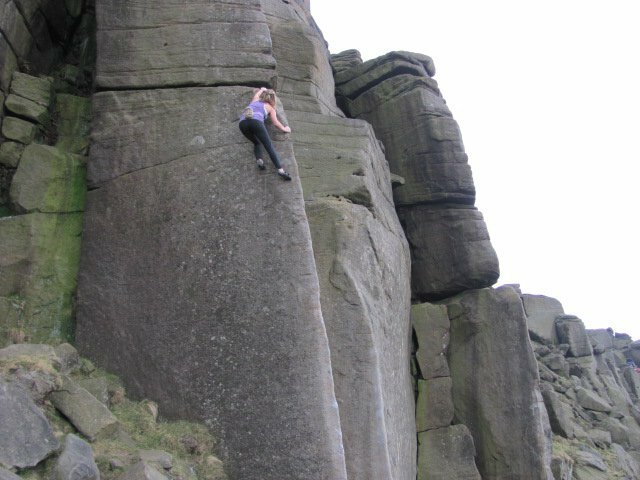 “That one has seen more airtime than British Airways” – Oh great just what I want to hear from my dad before setting off on Tufted Crack (E1 5c), Ilkley. 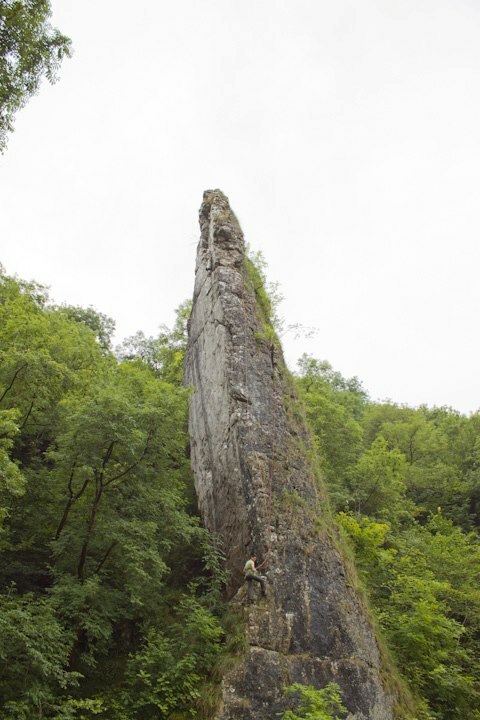 Back to yesterday’s escapade – I tried The Gladiator at Dovedale in the Peak. It’s at the top of the peak limestone graded list for E4 yet somehow managed to look quite innocent from the ground. This didn’t fool me, but I was psyched to for a struggle despite brewing expectations of being shut down. As you might guess, I took the weaker option by sitting on the cam, but even that option was scary! – I was freaking out as I did so because I thought it would pop! Climbing Easter Island (E1) a couple years ago. The Gladiator goes up the steep wall around to the left. After a couple minutes of de-pumping/trying to calm myself, I went up again and reached the holds I thought were good but was instantaneously pumped again! I managed to place some mediocre gear which I gingerly lowered myself onto in a completely panic-stricken state! I took a few more minutes to exclaim how traumatised I felt before pulling up onto the ledge and sketching my way to the belay. Was that brave?! I’m happy I had the courage to get on it (twice! ), and fear of committing to moves I was fairly likely to fall off with only mediocre gear seems justifiable… I probably wouldn’t have decked but the thought of taking a big fall on trad and some gear ripping TERRIFIES me. I’m not entirely sure where I’m going with this. That perhaps I’m hoping to pick up some tips on how to be braver and forge on with hard, well protected routes that I will fall off? 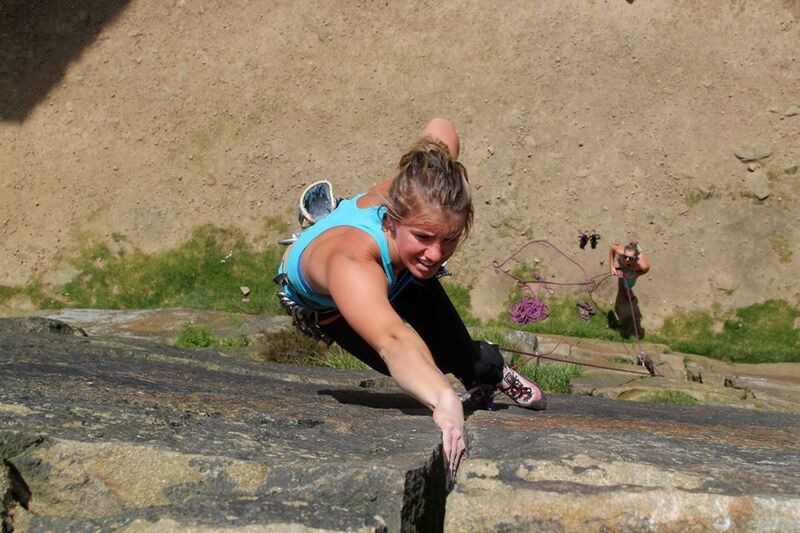 More simplistically, how can I overcome my fears, be braver and become a better climber? I’m hoping the focus of WCS14 wont just be on bravery on bold routes as I find these are usually easier for me as the lack of gear is compensated by easier climbing – with a cool head you shouldn’t fall off. I can’t imagine the WCS14 will be encouraging us to be brave and ‘go for it’ on bold routes hard enough that we may actually fall and hurt ourselves? I’m intrigued to find out this September! #beboldbebrave – I find the ‘fear’ just so fascinating. In essence it’s only a feeling yet it’s implications can be everything. PS. I hope this post doesn’t discourage anyone from trad climbing! It’s not all hard or scary and time heals most traumatic memories… I will probably have forgotten how scared I was on The Gladiator in a couple weeks!